Can I watch NBC live without cable? Alongside sports, local news stations are one of the biggest reasons that people are afraid to cut cable. Because these channels are so reliant on location, they aren’t typically advertised as well as national channels on cord cutting services like Sling TV. No one wants to cut cable only to learn the streaming service they subscribed to doesn’t actually carry the channel they’re looking for! Among local networks, NBC is of the most highly requested for cord cutters. With incredibly popular broadcasts like the Super Bowl and the Olympics, it’s easy to see why people don’t want to miss out on NBC. Fortunately, there are plenty of ways to watch NBC without being tied to a cable contract. In fact, it’s actually one of the easiest channels to get and is broadcast both over-the-air as well as through many different services. Can I get NBC with an antenna? What if I can’t get NBC with an antenna? Free 4k Apple TV with 4 months prepaid. If you Google “Watch NBC Live for Free”, you’ll see a lot of websites with questionable domains such as freestreamz.xyz or other similar sites on our website scam list. Although these websites might actually offer NBC live for free, you’re putting your security at risk by visiting them. Fortunately, there is a 100% legal way to watch NBC live; an antenna. NBC is one of the major stations that is broadcast over-the-air. As the name would imply, over-the-air TV means that signals are broadcast through the air and are able to be picked up with an antenna. People have been using antennas to watch their local news broadcasts as far back as the 1940s. You might remember old TVs with a pair of rabbit ears on top of it that had to be adjusted to pick up certain stations. Although rabbit ears are still a viable option for some locations, modern antenna technology has improved the quality, range, and overall design from back in the day. They’re much more “set it and forget it” and don’t need to be adjusted based on the channel or weather. In addition to a technological advancement of antennas, cable networks now offer higher quality signals that these modern antennas can pick up. Without getting into a long history lesson, in 2009 legislation was passed that switched analog over the air stations to digital and improved the picture. In fact, the picture received through an antenna can actually be higher quality than you get through a cable box. Although the reliability and picture quality is now comparable to cable the price definitely isn’t. Your cable bill is probably much more expensive than free! 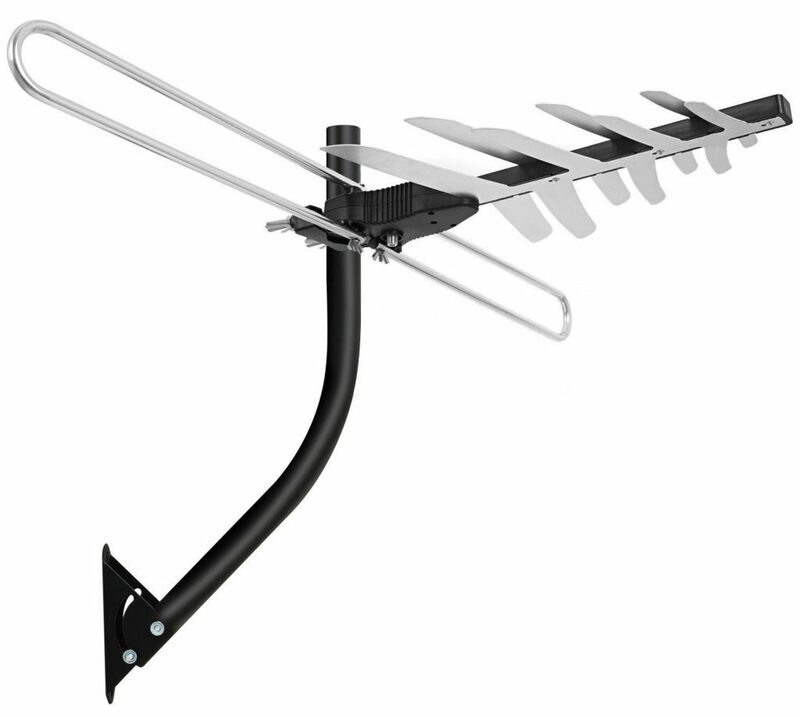 Even though over-the-air channels are free to pick up you still need to cover the initial cost of buying an antenna. However, even with the initial antenna investment, using it to pick up NBC is going to be the cheapest long term solution. The price of an antenna might come as a surprise to most people. Modern antennas that can pick up many different stations start as low as $15 and even the large outdoor antennas aren’t overly expensive. The stations you can pick up depend entirely on your location and will influence the decision on which antenna is best for you. Before you get too excited to and buy an antenna, keep in mind that NBC isn’t available in all locations! The section below will show you how to figure out which channels you can pick up with your antenna. As we said above, not everyone can pick up NBC with an antenna. Available antenna channels in your location is dependent on a lot of factors including distance from towers, surrounding landscape, and even the construction of your home. Thankfully, there are a handful of high quality resources on the web that helps to get rid of a lot of the guesswork involved in which stations you can pick up. If you’re interested, we’ve written a guide for getting free cable TV that will show you the steps to choosing an antenna that is a little more in depth than this article. The guide will show you how to figure out all of the cable channels you can pick up, what antenna type to use, and a brief description of some recommended antennas. If you’re looking for NBC in particular and just want a quick outline, the steps below are a great start. TVFool.com is a fantastic resource that shows users which TV stations they can get with an antenna. There are some other websites you can use like Antennaweb.org, but we recommend Tvfool due to its longevity and ability to share reports. It can be a little intimidating trying to learn how to read a TVFool report, but we’ve tried to simplify as best we can. To start, the site has a sidebar with a TOOLS section on the bottom. Click on “TV Signal Locator” and you’ll be brought to a new page. This page contains the form shown below. The title of the report is mostly for sharing purposes and you can leave it blank. 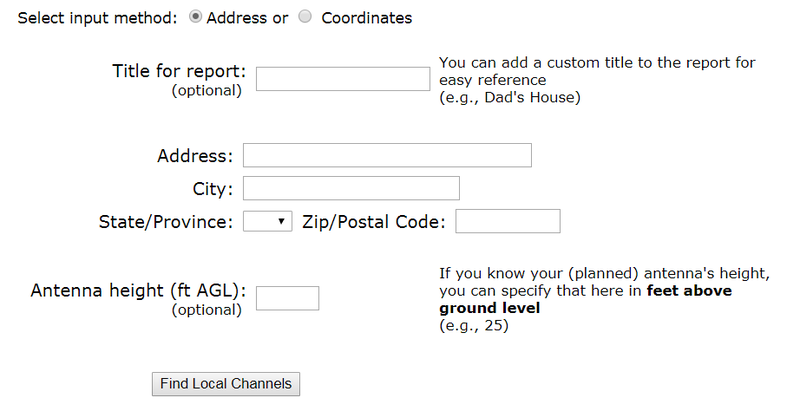 You can put in your address for specific information or just use a zip code for a quick test. The antenna height section is optional, but can really influence your signal availability. If you know you can use an attic or outdoor antenna you should try and make sure to note an accurate height. Height is one of the driving factors to boost antenna signal so if you want to use an indoor TV antenna, don’t specify 25′ or your TVfool report will be misleading. Once you put in all of the information and click the “Find Local Channels” button you’ll see a multicolored report. The most important section for you is going to be the colored table. If you look under the ==Channel== section and in the Netwk column you’ll see a bunch of network names. Look for NBC in this column and take note of the color. 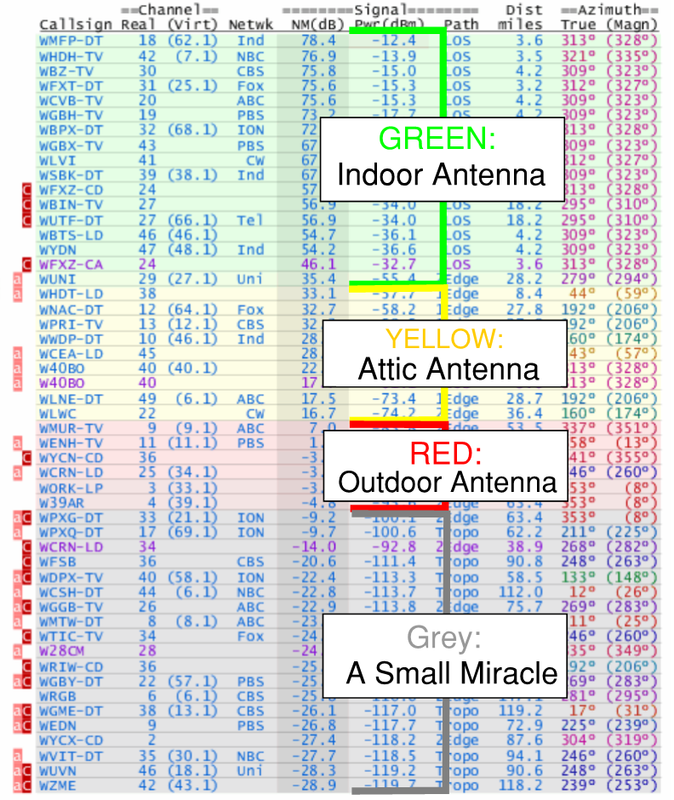 The example below shows which type of antenna is likely the best fit for you based on the color. There are other factors that play into antenna choice, but this outline should be a good start. One you know if you can get NBC for free with an antenna, you can read our complete guide to find the right one. Our recommendation for an indoor TV antenna is the 1ByOne TV Antenna from Amazon and our top rated attic antenna is 1ByOne 85 Mile Digital Amplified Antenna. There are plenty of other brands you can choose besides 1ByOne, they just happen to have a fantastic indoor and attic antenna. If your location doesn’t have NBC available don’t worry. Even if NBC is available but you’d rather not use an antenna, you still have plenty of options to watch NBC live without cable. If antennas are the bread of cord cutting, streaming services similar to Netflix or Hulu that offer live TV are the butter. There are numerous services available that have different price points and channel line ups to cater to every taste. We’ll outline a few of them below starting with the cheapest option first. Make sure you take a look at the service’s current channel line up because even though it’s cheaper, it might not offer the content you want. Sling TV is one of the most popular cord cutting options. It offers two base packages that cost less than most other services, but also contains less channels. To offset the difference, Sling TV has multiple add-on packages that you can purchase to personalize your service. These packages include the Outdoor package, News, Lifestyle, Kids and plenty more than range from $5-$10. It’s about as close as we can currently get to true “al la carte” TV. To get NBC on Sling TV you’ll need to purchase the larger of their two packages. This package is called their Blue package and costs $25 a month. The image below shows the current channel line up available at our Boston office. To see what channels are available to you, view Sling’s channel line up. Make sure to check Sling’s page here to see your local availability. Unfortunately, NBC isn’t available everywhere on Sling TV yet. If you’re in a location that does have it, Sling TV is hands down the cheapest option to watch NBC other than an antenna. At only $25 a month you can add on some additional packages or premium channels like HBO and it will still be the cheapest option. 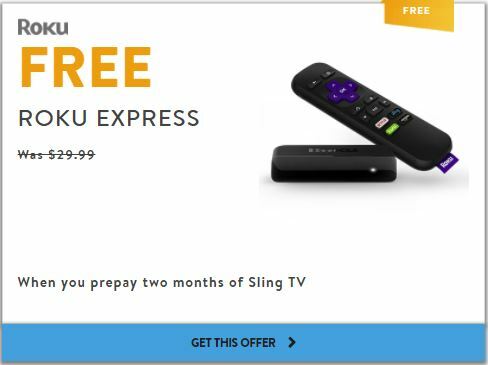 Another reason we like to suggest Sling TV is that it has some great device offers for first time cord cutters. Sling TV can run locally on some smart TVs or through a mobile device, but a streaming device that plugs into your computer is typically faster, easier, and more reliable. 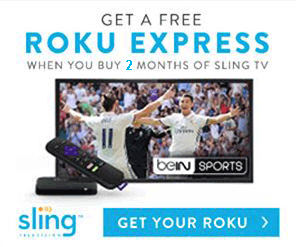 A Roku is our “go-to” recommendation and Sling TV will give you one for free if you sign up for two months of the service! If you want to read more about Sling TV, check out our complete guide and review. You’ve probably heard of DirecTV and might have even looked into satellite as your cable alternative. Although DirecTV is one option to cut cable, it’s still based on a contract and can be rather expensive. DirecTV Now on the other hand is something completely different. Unlike the parent company, DirecTV Now doesn’t require a satellite or a contract. It’s a streaming service similar to Sling TV that offers different sized packages for a low monthly price that you can cancel at any time. DirecTV Now was launched by AT&T in 2016 and has continued to improve its service since then. AT&T recently announced that their DirecTV Now subscriber count has surpassed 1 million. 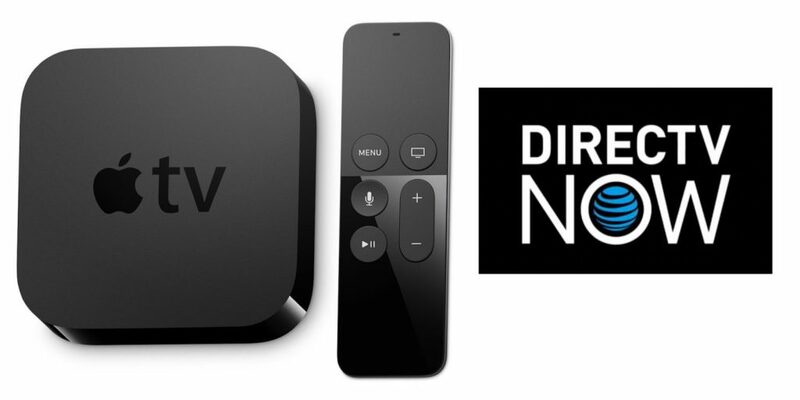 We find ourselves recommending DirecTV Now often due to it’s low starting price and density of popular channels. Although not as customizable as Sling TV, DirecTV Now makes sure it’s packages are well worth the expense. To get NBC with DirecTV Now you’ll only need to purchase their smallest package. This package, called “Live a Little”, costs $35 a month and includes over 60 popular cable channels. 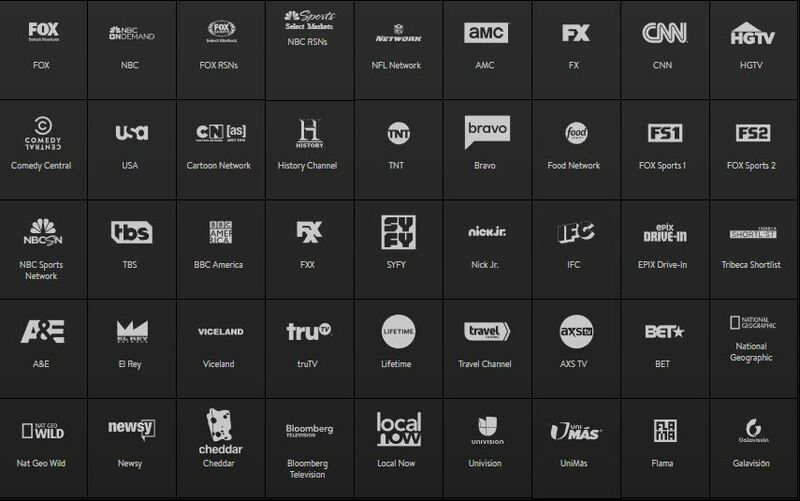 The image below shows all of DirecTV Now’s available channels with the “Live a Little” options shown in white. This channel lineup is for our Boston office so make sure to check out their current channel lineup for your location. The biggest complaint we have with DirecTV Now is its complete lack of a DVR. Some services, like Sling TV, charge a small monthly premium for a DVR while others like YouTube TV include it for free. DirecTV Now has announced that they would be offering a DVR feature sometime in early 2018, but we haven’t seen an update and aren’t holding our breaths. If you’ve been on the internet in the last ten years you’ve probably heard of YouTube. It has been the dominant online video platform and appears everywhere from blogs to news sites. In fact, we’ve even recently started posting some antenna review videos on YouTube ourselves! 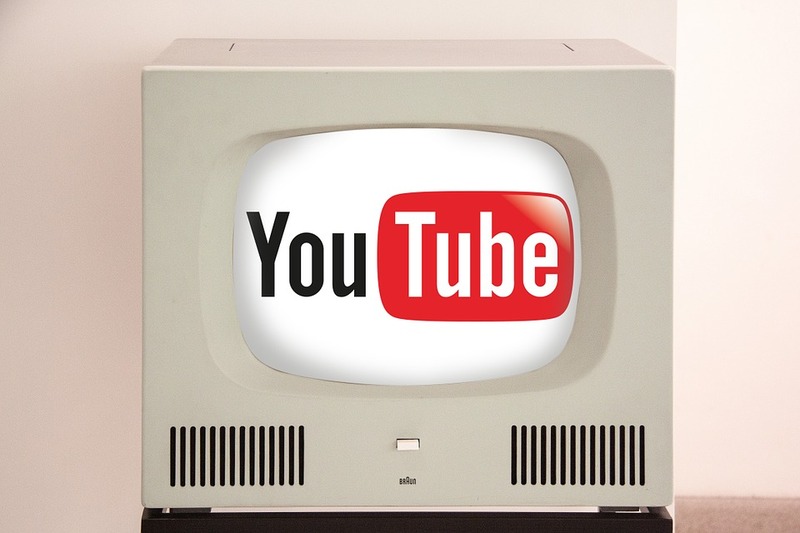 Google, the owner of YouTube, has recently launched a paid streaming service that offers live TV called YouTube TV. It’s been incredibly popular with cord cutters and offers a DVR that no other streaming service can compete with. 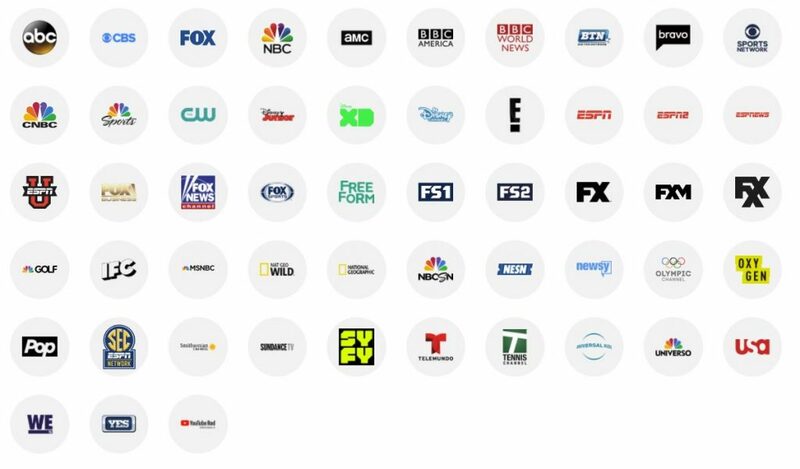 Unlike some of the other services, YouTube TV has a one size fits all package scheme. Please note that YouTube TV is adding a few channels and increasing the price to $40 a month starting on March 13, 2018. If you subscribe to the service before that though you’ll be locked into the $35 price. The new channels added to YouTube TV are Adult Swim, Cartoon Network, Classic Movies, CNN, HLN, TBS, TNT, and truTV and should help to offset the price difference. In addition to these new channels, YouTube TV offers a solid channel line up in their one size fits all package. The image below shows the channels available at our Boston office. 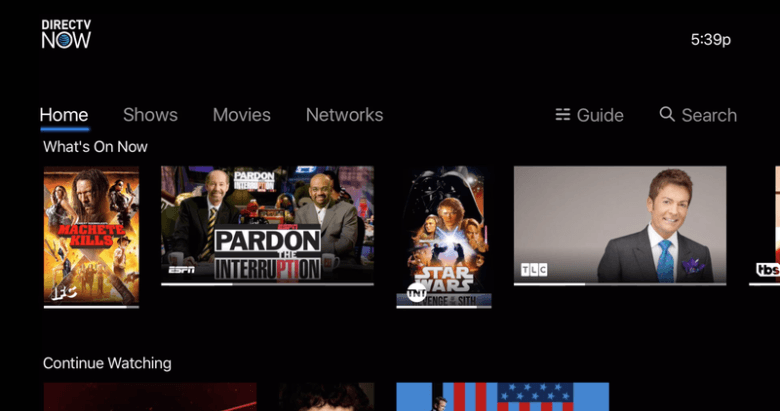 YouTube TV might not offer a lot of packages or many add-ons, but the package they’ve created is dense with quality channels. YouTube TV is particularly good with local news stations such as ABC, CBS, and of course NBC. They are continuing to expand their service throughout the country, but make sure you check to confirm local station availability in your area. You can view the YouTube TV channel line up on their homepage. As we mentioned before, YouTube TV has a phenomenal DVR service. Being the extension of a massive video database site has its perks. Their cloud DVR is included for free with the service and allows you to store unlimited hours worth of content. The days of cleaning out the DVR and being careful about what you record are over. The fact that you know your DVR and streaming service in general is owned by Google and will be reliable until the internet itself crashes is also an added benefit of the service. While YouTube TV doesn’t offer any device offers, they do have a free trial. It’s also compatible with almost every major streaming device and the choice is totally up to you. However, we do recommend you stay away from the Amazon Fire TV due to some conflict between the two companies and questions about their ongoing relationship. 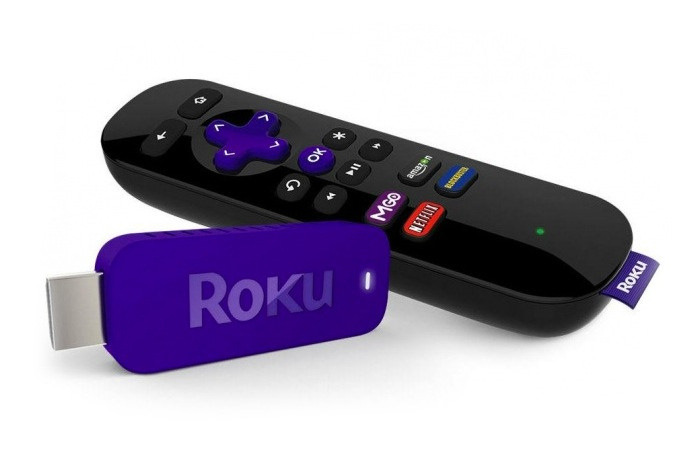 We recommend a Roku device for most situations but there are plenty of other options.